Acting in Goodness Leads to Knowledge? Acting in Goodness Purifies One? Devotees are Not Anxious for Fruitive Rewards? Without Humility Understanding is Harmful? Meditation On Other Than the Visnu Form? Spiritual Master Can Drive Away All Nescience? More palitable for the public? Material Existence is Suffering Only? Sacrificing the Material Body For the Sake of Religion? Devotees are Liberated and Their Minds are Peaceful? Brahmacaris Are Austere and Simple? “Faithfulness” is one of the Opulences of a Woman? Brahma is the “creator god”? Swans “Digging into” the Lotus Flower? What Happened to the Purport? Brahma has 4, 8, 16, 32, etc heads? Sense Control, Regulative Principles, etc. One who restrains the senses and organs of action but whose mind dwells on sense objects certainly deludes himself and is called a pretender. On the other hand, if a sincere person tries to control the active senses by the mind and begins karma-yoga [in Krsna consciousness] without attachment, he is by far superior. O sinless one, the mode of goodness, being purer than the others, is illuminating, and it frees one from all sinful reactions. Those situated in that mode become conditioned by a sense of happiness. The result of pious action is pure and is said to be in the mode of goodness. But action done in the mode of passion result in misery, and actions performed in the mode of ignorance results in foolishness. …The person who is attached to Krsna and works for Him only is certainly a liberated person, and he is not anxious for fruitive rewards. …The person who is attached to Krsna and works for Him only is certainly a liberated person, and he has no anxiety over the results of his work. In this verse it is clearly stated that at the time of death the mind must be fixed in devotion the Supreme Godhead. For those practiced in yoga, it is recommended that they raise the life force between the eyebrows, but for a pure devotee who does not practice such yoga, the mind should always be engaged in Krsna consciousness so that at death he can remember the Supreme by His grace. This is explained in verse fourteen. In this verse it is clearly stated that at the time of death the mind must be fixed in devotion on to the Supreme Personality of Godhead. For those practiced in yoga, it is recommended that they raise the life force between the eyebrows (to the ajna-cakra). The practice of sat-cakra-yoga, involving meditation on the six cakras, is suggested here., but for a pure devotee whoA pure devotee does not practice such yoga, but because he is always engaged in Krsna consciousness, so that at death he can remember the Supreme Personality of Godhead by His grace. This is explained in verse fourteen. The particular use of the word yoga-balena is significant in this verse because without practice of yoga one cannot come to this transcendental state of being at the time of death. One cannot suddenly remember the Supreme Lord at death unless he is practiced in some yoga system, especially the system of bhakti-yoga. Since one’s mind at death is very disturbed, one should practice transcendence through yoga during one’s life. The particular use of the word yoga-balena is significant in this verse because without practice of yoga–whether sat-cakra-yoga or bhakti-yoga–one cannot come to this transcendental state of being at the time of death. One cannot suddenly remember the Supreme Lord at death; one must have practiced some yoga system, especially the system of bhakti-yoga. Since one’s mind at death is very disturbed, one should practice transcendence through yoga during one’s life. Lord Krsna explains that Brahman, although one without a second, has different manifestations and features. For the impersonaliststhe syllable om is identical with Brahman. Krsna here explains the impersonal Brahman in which the renounced order of sages enter. Lord Sri Krsna has recommended to Arjuna the practice of sat-cakra-yoga, in which one places the air of life between the eyebrows. Taking it for granted that Arjuna might not know how to practice sat-cakra-yoga, the Lord explains the process in the following verses. The Lord says that Brahman, although one without a second, has various manifestations and features. Especially for the impersonalists, the aksara, or omkara– the syllable om– is identical with Brahman. Krsna here explains the impersonal Brahman, in which the renounced order of sages enter. …One need not read many books on different subject matters; the ability to remember a few and quote them when necessary is another opulence. And the ability not only to read many books on different subject matters but to understand them and apply them when necessary is intelligence (medha), another opulence. …One has to get rid of all three stages of attachment to the material world: negligence of spiritual life, fear of a spiritual personal identity, and the conception of void that underlies the frustration of life. …One has to get rid of all three stages of attachment to the material world: negligence of spiritual life, fear of a spiritual personal identity, and the conception of void that arises from frustration in life. …So, by the slow process of devotional service, under the guidance of the bona fide spiritual master, one can attain the highest stage, being freed from all material attachment, from the fearfulness of one’s individual spiritual personality, and from the frustrations resulting from void philosophy. Then one can ultimately attain to the abode of the Supreme Lord. …So, by the slow process of devotional service, under the guidance of the bona fide spiritual master, one can attain the highest stage, being freed from all material attachment, from the fearfulness of one’s individual spiritual personality, and from the frustrations that result in void philosophy. Then one can ultimately attain to the abode of the Supreme Lord. …If anyone wants to compete with God and at the same time make advancement in spiritual knowledge, he will be frustrated. It is clearly stated that without humility understanding is harmful. To think oneself God is most puffed up. Although the living entity is always being kicked by the stringent laws of material nature, still he thinks, “I am God” because of ignorance. One should be humble and know that he is subordinate to the Supreme Lord. …If anyone wants to compete with God and at the same time make advancement in spiritual knowledge, he will be frustrated. It is clearly stated that without humility understanding is not truely possible. To think oneself God is most puffed up. Although the living entity is always being kicked by the stringent laws of material nature, still he thinks, “I am God” because of ignorance. The beginning of knowledge, therefore, is amanitva, humility. One should be humble and know that he is subordinate to the Supreme Lord. …The so-called yogis who meditate on something which is not the Visnu form simply waste their time in a vain search after some phantasmagoria. We have to be Krsna conscious–devoted to the Personality of Godhead. This is the aim of the real yoga. …The so-called yogis who meditate on something which is not on the Visnu platform simply waste their time in a vain search after some phantasmagoria. We have to be Krsna conscious–devoted to the Personality of Godhead. This is the aim of the real yoga. …Therefore, mental speculation or dry arguments cannot help one progress in spiritual life. One has to approach a bona fide spiritual master to receive the knowledge. …Therefore, mental speculation or dry arguments cannot help lead one to the right path. Nor by independent study of books of knowledge can one progress in spiritual life. One has to approach a bona fide spiritual master to receive the knowledge. Therefore, one has to seek out such a bona fide spiritual master and, under him, learn what Krsna consciousness is. The Spiritual master can drive away all nescience, as the sun drives away darkness. Therefore, one has to seek out such a bona fide spiritual master and, under him, learn what Krsna consciousness is,for Krsna consciousness will certainly drive away all nescience, as the sun drives away darkness. The living entity, by accepting his material existence as just so much suffering, can become situated in his spiritual existence. The living entity, by accepting his material existence, has become situated differently than in his spiritual existence. …Being a great devotee of the Lord, he was transcendentally situated, but because he was the king of Mithila (a subdivision of Behar province in India), he had to teach his subjects how to fight righteously in battle. He and his subjects fought to teach people in general that violence is also necessary in a situation where good arguments fail. …Being a great devotee of the Lord, he was transcendentally situated, but because he was the king of Mithila (a subdivision of Bihar province in India), he had to teach his subjects how to perform prescribed duties. Lord Krsna and Arjuna, the Lord’s eternal friend, had no need to fight in the Battle of Kuruksetra, but they fought to teach people in general that violence is also necessary in a situation where good arguments fail. …Arjuna was advised to fight and to sacrifice the material body for the cause of religion. …Arjuna was advised to fight and not sacrifice the cause of religion for material, bodily considerations. The word tejas used here is meant for the ksatriyas. The ksatriyas should always be very strong to be able to give protection to the weak. They should not pose themselves as nonviolent. If violence is required, they must exhibit it. The word tejas used here is meant for the ksatriyas. The ksatriyas should always be very strong to be able to give protection to the weak. They should not pose themselves as nonviolent. If violence is required, they must exhibit it. But a person who is able to curb down his enemy may under certain conditions show forgiveness. He may excuse minor offenses. The yogi whose mind is fixed on Me verily attains the highest perfection of transcendental happiness. He is beyond the mode of passion, he realizes his qualitative identity with the Supreme, and thus he is freed from all reactions to past deeds. Then svadhyaya, Vedic study, and tapas, austerity, and arjavam, gentleness or simplicity, are meant for brahmacarya or student life. Brahmacaris should have no connection with women; they should live a life of celibacy and engage the mind in the study of Vedic literature for cultivation of spiritual knowledge. This is called svadhyaya. Then svadhyaya, Vedic study is meant for brahmacarya or student life. Brahmacaris should have no connection with women; they should live a life of celibacy and engage the mind in the study of Vedic literature for cultivation of spiritual knowledge. This is called svadhyaya. As far as simplicity is concerned, not only should a particular order of life follow this principle, but every member, be he in the brahmacari asrama, or grhastha asrama, or vanaprastha asrama or sannyasa asrama. One must live very simply. As far as the brahminical quality of simplicity is concerned, not only should a particular order of life follow this principle, but every member, be he in the brahmacari asrama, grhastha asrama, or vanaprastha asrama or sannyasa asrama. One should be very simple and straightforward. It is said that the soul is invisible, inconceivable, and immutable. Knowing this, you should not grieve for the body. Unintelligent men, who know Me not, think that I have assumed this form and personality.Due to their small knowledge, they do not know My higher nature, which is changeless and supreme. Unintelligent men, who do not know Me perfectly, think that I, the Supreme Personality of Godhead, Krsna, was impersonal before and have now assumed this personality. Due to their small knowledge, they do not know My higher nature, which is imperishable and supreme. …Then the process is set rolling again. These four yugas, rotating a thousand times, comprise one day of Brahma, the creator god, and the same number comprise one night. Brahma lives one hundred of such “years” and then dies. …Then the process is set rolling again. These four yugas, rotating a thousand times, comprise one day of Brahma, and the same number comprise one night. Brahma lives one hundred of such “years” and then dies. We Can’t Create Matter From Nothing? And “Krishna is the supreme creator of all individual souls”? …A fragmental part and parcel of the Lord, namely the living entity, may by manipulation of material energy construct a skyscraper, a factory, or city, but he cannot create matter out of nothing, and he certainly cannot construct a planet ora universe. The cause of the universe is the Supersoul, Krsna, the supreme creator of all individual souls and the original cause of all causes, as the Katha Upanisad (2.2.13) confirms . Nityo nityanam cetanas cetananam. …A fragmental part and parcel of the Lord, namely the living entity, may be the cause of a big skyscraper, a big factory, or even a big city, but he cannot be the cause of a big universe. The cause of the big universe is the big soul, or the Supersoul And Krsna, the Supreme, is the cause of both the big and small souls. Therefore He is the original cause of all causes. This is confirmed in the Katha Upanisad (2.2.13) Nityo nityanam cetanas cetananam. …Similarly pranava, or the omkara transcendental sound used in the beginning of every Vedic hymn to address the Supreme Lord also emanates from Him. …And pranava, or the omkara transcendental sound in the beginning of every Vedic hymn, addresses the Supreme Lord. Of all the aquatics the shark is one of the biggest and is certainly the most dangerous to man. Thus the shark represents Krsna. Among the creators and living entities, Brahma is the chief. The various Brahma’s exhibit four, eight, sixteen, etc., heads accordingly, and they are the chief creators in their respective universes. The Brahmas are representatives of Krsna. Among the living entities who are creators, Brahma, who has four heads, is the chief. Therefore he is a representative of the Supreme Lord, Krsna. There are some very major changes to the purports, and it is wrong! I became familiar with ISKCON at the age of 40, and I like to observe. I have seen a lot of devotees that are so smart, but a smugness and pride has overcome that intelligence. One cannot say he worships God and play him at the same time. Thank you for your devotion and dedication to Srila Prabhupada. I feel so badly that there is such a tear in the society. Some people…we all…have been hurt. 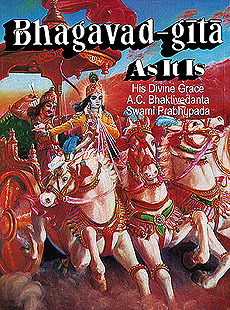 I remember having the original Gita at a book study, and others did also, and when we were to turn to a certain page, the pages didn’t add up to the new edition, and it caused a stir, and the class was disrupted, and the original book was no longer allowed. It doesn’t have to be this was, and it shouldn’t. All the the different copies of the book should be allowed at the temple, but especially the original. 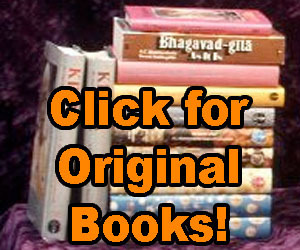 Srila Prabhupada was so proud to have authenticated these great books so that if people questioned, there would be no mistake. We all love Prabhupada. Can we please just think of him and back down on the issue a little? Please. This is a great service, the original version should become again the standard version. Looking at these changes I can clearly see where several faults from ISKCON arised from. I am a university-trained translator and I am aghast at the nature of some of these translations; certainly at the nature of the translations above. The changes are significant, and they change and/or omit the meanings. Steps have been taken that proofreaders and translators are taught not to take! Hi, I’m so sad about all this. I want to read the original Bhagabad Gita As It Is. Any link? Thanks and Hare Krsna !! !